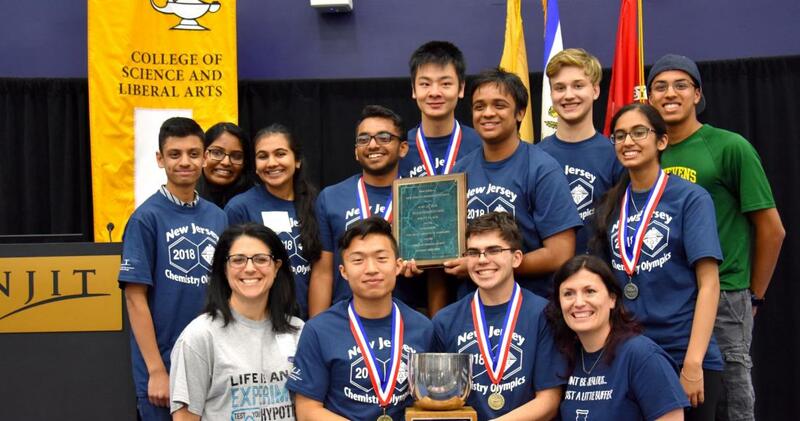 On May 22, 2018, NJIT hosted more than 300 of Northern New Jersey’s most exceptional high school chemists as they competed for academic glory in the Thirty-Third Annual New Jersey Chemistry Olympics. The Olympics — organized by NJIT's Department of Chemistry and Environmental Science and the North Jersey Section of the American Chemical Society (NJACS) — brought together more than 28 student teams from 18 high schools, meeting to match wits in an afternoon of competitive research events, science communication challenges and live lab competitions. Additional funding was provided by Merck and Exemplify BioPharma. As the ceremony’s medalists were announced and awards were tallied, Edison, New Jersey’s John P. Stevens High School's Team A emerged as this year’s overall victors, taking home a total of three medals across the competition’s three major categories. They also took home the competition’s grand prize: the “2018 Platinum Crucible”. This year’s Olympics featured a total of 10 events divided within three distinct categories for teams to compete in: “General Events”, “Lab Events” and “Research Events”. The competition’s “General Events” category featured events testing teams’ skills as science communicators through stage presentations and website demonstrations before live audiences. The category’s events challenged teams to engage audiences while conveying scientific concepts such as polymerization and the chemistry underlying the smells and flavors associated with strawberry and peppermint. The afternoon’s “Lab Events” category showcased each team’s accuracy and precision in the lab — featuring challenges to transform Smartphones into UV-Vis spectrophotometers for lab analysis, and competitions to create design and test procedures for measuring caffeine in popular energy drinks. Finally, teams competing in the “Research Events” category were tested to conduct and submit their own research within structured topics, ranging from research of bioplastics toward environmental sustainability efforts, to research detailing how to improve the production of edible chocolate through analysis of chocolate’s crystalline structure. Jiang and Neves took gold medals in the “Environmental Chemistry Research” event for their unique bioplastics research showing how they were able to produce eco-friendly bioplastics from discarded banana peels. The competition’s end-of-day award ceremony closed with special speaking appearances from New Jersey Chemistry Olympics alumni and Harvard University chemistry Ph.D. candidate Jason Anesini, as well as Kevin Campos, executive director of process chemistry at Merck. For additional information about the competition’s 2018 medal winners, participating schools, advisors, event descriptions and more, visit: http://njchemistryolympics.com.